While tables are our specialty, every now and then Rustic Trades Colorado gets the opportunity to take part in some very unique projects. We are so honored that the wonderfully artistic, Teresa Davis, principal designer of Denver-based Post 31 Interiors, commissioned our team to build a gorgeous reclaimed canopy bed for a very special event. The handcrafted project was on display during the 2015 Liv Sotheby's Denver Designer Showhouse, a back-to-back weekend event which raised funds to benefit Colorado Children’s Hospital. The show consisted of 16 local interior designers putting their creative, professional touch on each room of a modern Cherry Creek townhome. The dual floor plan allowed for one side of the duplex to have a neutral palette, while the other could go crazy with color. Teresa is a world traveler and much of her design inspiration is drawn from her international journeys. It was a recent trip to Paris that influenced her choice of an Ellie Cashman botanical wallpaper. The oversized flowers and bold black backdrop made for a striking statement, which was perfectly balanced by the delicate, life-like lines of the petals and soft pastel pinks. There’s no doubt, florals are on-trend and we bet you’ll start seeing similar designs as more blossom inspired prints make their way across the pond. Taking full advantage of this basement room, Teresa opened up the windows to allow the fresh outdoor air to flood into the area . Some might view this closed-in space as a decorating challenge, but Teresa gave it an imaginative spin. She completed the space with two large trees, a fountain, and live butterflies (yes, real butterflies! ), giving the room a whimsical feel. With it’s sleek straight lines, this chair took a modern spin on a very classic piece. The soft, velvety textured upholstery, along with the exposed brass nailheads and rich camel color, added an extra touch of warmth to the room. Accompanied with a cozy blanket and charming gold-leaf accent table, this corner carved out the perfect reading nook for guests. You can never go wrong by adding a timeless wingback chair to any room. We may be biased, but we think this bed turned out to be just gorgeous! The raw wood elements made a beautiful partnership with the soft floral backdrop. Teresa chose a simple, deep gray fabric for the upholstered headboard. It’s a neutral color that will go with just about anything, but she knew this bed would likely find a new home after the event. 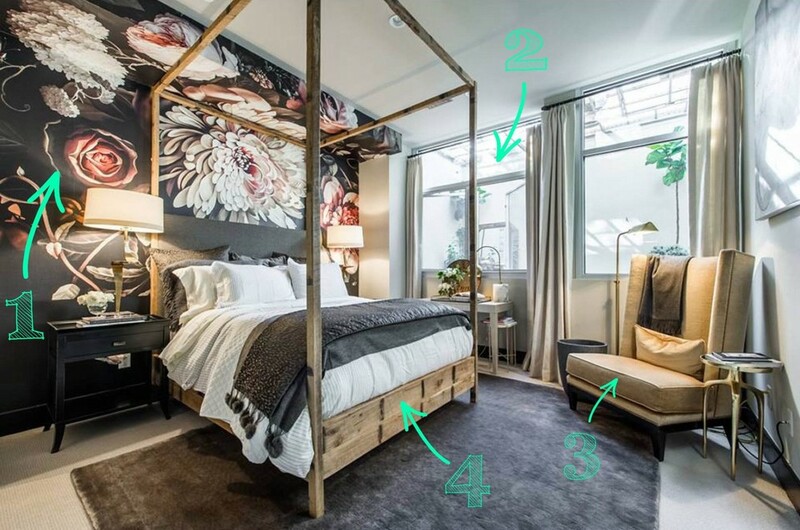 What’s wonderful about the frame design, is the bed can be disassembled so that the fabric can easily be swapped if personal tastes or color palettes change down the road. The frame was made entirely of reclaimed white oak and the timbers were hand selected by the Rustic Trades team for their first-rate quality and aesthetic appeal. As any good carpenter knows, each piece of reclaimed lumber has a unique story to tell. Despite our best efforts, we’re still not sure the exact age of the lumber or precisely how far it traveled before making it’s way to Colorado. We did learn, however, that the repeating black marks (which just so happened to go perfectly with the wallpaper), were left behind from the steel tracks used for a rail system, as railroad tracks are typically transported by support of oak beams. We were overjoyed to see these repurposed oak timbers find a new life after serving a great purpose in building our country's railways. Teresa and the RTCO team agreed to leave the unique natural patina exposed to display the authentically aged and rustic elements. If you missed the event and would like to see more rooms from the Denver Designer Showhouse, be sure to check out the 2015 winter issue of Luxe Colorado magazine, due to hit stands in November.